Play that funk music, grandma! I’m a big fan of electronic music, and was floored when Ruth Flowers, aka DJ Mamy Rock, landing in my inbox. 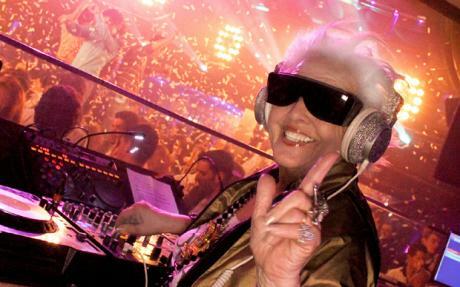 “Mamy” refers to the fact that Ruth Flowers is a 69 year-old grandma, and “Rock” is what she is doing every single weekend as one of the world’s hottest DJs. Yep, you read that right. She is a DJ, she is 69 years young, and is a grandma. She’s been getting rave reviews and mad worldwide media attention over the past year, and has just released her first single, “Still Rocking.” The tune is actually really good, and she is quite the inspiration. She soon met up with a French music producer, who encouraged her to become a DJ. Very clever on his part, because she was an instant media sensation. It also helps that she was actually pretty damn good. And imagine what the Golden Girls would have been like had Ruth Flowers been in the mix…perhaps we could dream about a Betty White/Ruth Flowers dance remix?!? !